This is a logical extension of Amazon's penchant for control of its processes and can be thought of as a physical manifestation of its market-leading AWS data cloud management service. Rumors of its transportation and logistics expansion have been rife for years, including the purchase of European delivery companies and the lease of cargo planes. Amazon is planning to expand a delivery service that it's already using in India, and currently testing on the West Coast. 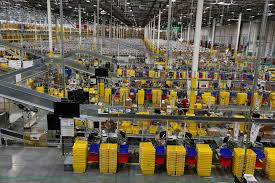 Amazon has been steadily pushing for more control of its logistics.Playing a bigger role in the delivery process can save Amazon money, enable it to accommodate more customers, and give the company more control over how fast packages get to Prime members. "Amazon can now use vendor managed space and inventory as essentially their own fulfillment centers." UPS and FedEx shares took a dip in the wake of reports that Amazon is testing a new delivery service that may eventually allow the online giant to bypass those shipping companies and ferry its own items from the warehouse to the front door. UPS shares were down 2% and FedEx shares dropped 0.6% after a Bloomberg report that Amazon is planning to expand a delivery service that it's already using in India, and currently testing on the West Coast, to more customers in the U.S. next year. Amazon, whose stock was up 0.8%, could not be immediately reached for comment. The new service is dubbed Seller Flex, citing an unidentified source. Such a system could enable Amazon — which disrupted traditional brick and mortar retail with its e-commerce model and is shaking up the grocery space with its recent $13.7 billion purchase of Whole Foods — to eventually roil the players who have long dominated the package shipping business. The report says that the new delivery service would specifically ferry packages that are sold on Amazon's website by third parties. Amazon has reportedly sold $1.6 million of Whole Foods' store brand products online in the first month since taking over the organic grocery chain. Amazon has been steadily pushing for more control of its logistics. In 2014, a year after delivery snags prevented some of its orders from being delivered in time for Christmas, Amazon bought a 4.2% stake in the U.K. shipping service Yodel, as well as a 25% stake in Colis Prive, a parcel delivery business based in France. The following year Amazon became the full owner of the French company. Amazon also bought thousands of trailers in 2015 that it stamped with its brand in order to carry orders from its over 50 U.S. fulfillment centers, to hubs where its employees sort the packages by zip code. Reports also surfaced that year that Amazon was negotiating with Boeing to lease 20 767 freighter jets in order to possibly launch its own air cargo line. Playing a bigger role in the delivery process can save Amazon money, enable it to accommodate more customers, and give the company more control over how fast packages get to its lucrative Prime members. In 2014, it spent $8.7 billion on shipping, more than double what it earned from sales of products that need to be transported to customers homes. FedEx spokesman Patrick Fitzgerald said in a statement that the company doesn't comment on speculation.